Look at my new kitchen! The new banquette seating is a DIY hack of four IKEA benches. Stay tuned for sources and instructions to make it yourself. Remember what my kitchen used to look like? See, my friends at my first Harlem dinner party could have been a lot more comfortable. Also, don’t buy these chairs- one of the four I got from Amazon sent me crashing to the ground the first time I sat down on it. I only got rid of it yesterday. To put it clearly, my challenge was to devise seating that could accommodate up to eight for a dinner party while not jutting into the long runway of my cooking space. Enter the banquette. Banquette seating involves a long, upholstered bench placed along, or sometimes built into, a wall. 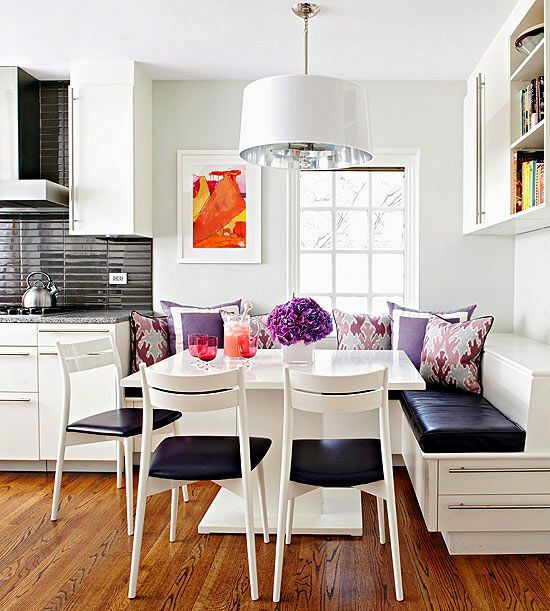 They’re perfect for kitchens and breakfast nooks because when you don’t have to move the bench in and out to take a seat, you can save at least a foot of space. They also lend a sense of permanence to the space and can up your cabinetry with shelves and drawers. Yes, storage is key! So naturally I took to Pinterest to collect ideas. Here are some of my favorites that informed the concept. I’ll cover the materials and sources to DIY and bring it all together for not too much money in another post. Make sure you like the Runaway Apricot Facebook page so you can see when the how-to is posted! Would you look at the table on this one via Apartment Therapy? The pedestal shape is ideal so you can easily slide your knees under. Also love the denim and funky mix of pillows. This one is built right out of the same high-gloss material as the cabinets for the ultimate built-in look. With some added seating. Couldn’t you see 8 people there? I believe the source is Better Homes and Gardens. Something a bit more formal: a dining room table banquet built into an over-sized bay window. I covet this in a future house. And the owners from this Vogue article say that the expandable table has fit up to sixteen guests! This tiny little corner cafe table can now fit 4 or 5 adults. That’s winning. Also, this construction looks so easy I almost convinced myself I could DIY. Last, but certainly not least, the stunning pop of that orange band against this very neutral seat might have been what got me hooked on the idea. Check out the under-cubbies at Remodelista. Digging the new kitchen! Excellent idea. We’re thinking of that with our living room which is very small. Now if you figure out a good design for a hat rack on the wall, I’ll be very much appreciated! Also rasberry tart recipe in request! I have a recipe up for a peach and raspberry tart. I tend to have raspberry with something else (peanut butter, chocolate, other fruit) because the flavor is so potent.